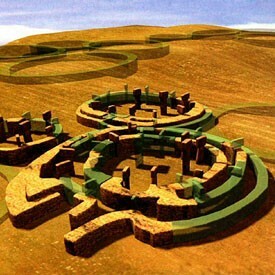 Göbekli Tepe is the oldest known example of monumental architecture. It was built between 9600 and 8200 BCE. Its builders lived in a world without wheels, writing, metal, or pottery. 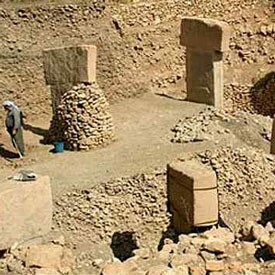 German archaeologist Klaus Schmidt discovered Göbekli Tepe in 1994. Inches below the surface, his team struck an elaborately fashioned stone, then a circle of stones, and then more. Geomagnetic surveys in 2003 revealed at least 20 rings piled together under the earth. The circles are made from big limestone pillars interconnected by low stone walls. The pillars weigh up to 16 tons. Swarming over their surfaces are animal bas-reliefs, each in a different style. The researchers found no signs of habitation. Hundreds of people must have been required to carve and erect the pillars. There is also no trace of agriculture. To judge by the bones found at the site, the workers were fed by shipments of game from faraway hunts. All of this endeavor must have had organizers. According to the concept of the neolithic revolution, some early humans embraced agriculture. To tend their fields, they had to stop wandering and move into permanent villages, where they developed new tools and created pottery. As people began to live together in larger groups, population and innovation soared. Religion and art flourished. The revolution first occurred in the Fertile Crescent. In the Levant, Natufian villages sprang up at the end of the last ice age. The Natufians lived in villages of up to several hundred people. They were foragers, hunting gazelles and gathering wild grasses. The villages ran into hard times around 10 800 BCE, when temperatures fell and created drier conditions. A number of villages became too populous for the local food supply. Farming may have arisen as a response to the crisis. Göbekli Tepe suggests that organized religion could have come before the rise of agriculture and other aspects of civilization. It suggests that the human impulse to gather for sacred rituals arose as humans shifted from seeing themselves as part of the natural world to seeking mastery over it. 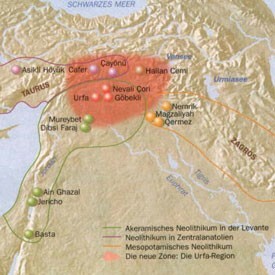 Schmidt speculates that foragers living around Göbekli Tepe first created the temple and then developed agriculture. AR Neolithic psychology is deeply mysterious. But ideal superstructure preceding material basis? How un-Marxist!